If there are two things that are truly holy to me in this world it’s beer and cookies. To date I’ve officiated two weddings for friends, and if I can unite any two great things into matrimony – I’ll jump at the chance to do so. I think about beer a lot, it’s kind of hard not to when you work in a Brewery and you smell it, live it, and taste it pretty much everyday of your life. It’s a very hard life as you’d imagine, having to be so beer-centric and all. Anyways, it was on my way home from work I decided I wanted to try something new: beer cookies. I bake with beer a lot, but never in the capacity of cookies; which happen to be my specialty. I’ve shared recipes on this blog before so even though I’m still ironing out the kinks, I thought I’d share how you can make your own. -1 can craft beer (because who wants PBR cookies?) of your choice room temperature – I would try to compliment the butterscotch with something light, floral, and mildly hoppy, but do as you will. I don’t own you. Mix the butter or margarine with the brown and granulated sugars. Let your butter or margarine soften either by leaving it or prior to baking or microwaving for a few seconds at a time. Add the two eggs and stir in. Do not use a electric mixer. Add Baking Soda, Almond Extract, and Cinnamon. Cut in flour – when I say ‘heaping cups’ – don’t be shy. You almost want to feel like you’re putting in too much. Trust me. Add Walnuts and Butterscotch chips. Now you add the beer, I recommend mixing in almost 12 ounces and if it seems to watery, pack the dough down and pour some down the drain and add a splash of flour. When the dough is done place in your fridge for 30-45 minutes until it’s chilled. Roll dough into balls and place on a cookie sheet. Cook in oven at 350 degrees for 13-15 minutes. Let cool before removing them from pan, they should be light golden brown on the bottom. Bring to your friends/coworkers/significant other and relish in the coolness factor of being the person who made beer cookies (it feels good). In my cookies I used Uinta Brewing Company’s Wyld EPA, a 4.0% Extra Pale-Ale that has a subtle maltiness and a sweet hop flavor with notes of citrus and pine. 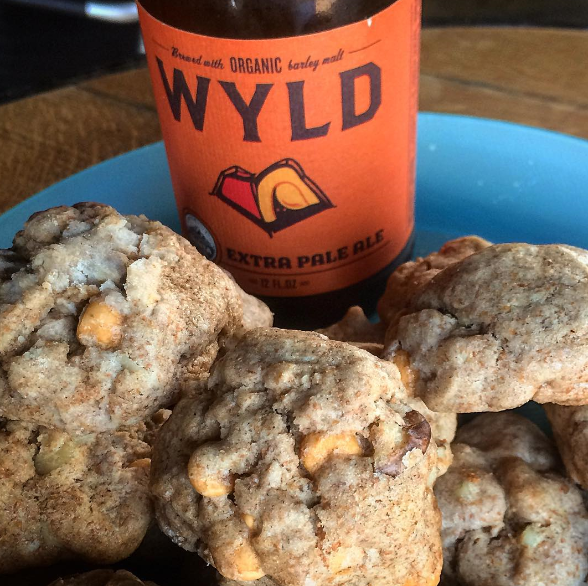 Posted in Uncategorized.Tagged beer, beer cookie recipe, beer cookies, beer cooking, cooking with beer, craft beer, epa, extra pale ale, good beer, i love beer, uinta, uinta brewing, wyld. You are making me both hungry and thirsty. I should send you some cookies and beer then!